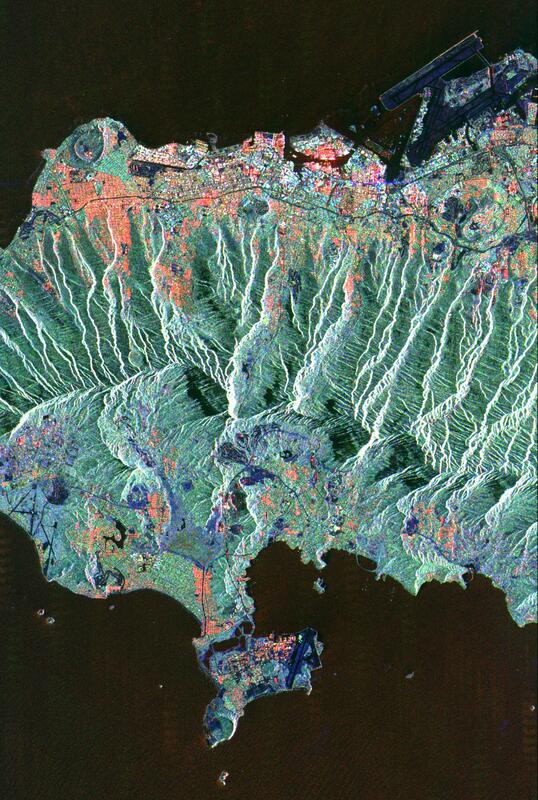 This spaceborne radar image shows the city of Honolulu, Hawaii and adjacent areas on the island of Oahu. Honolulu lies on the south shore of the island, along the bottom of this image. Diamond Head, an extinct volcanic crater, is seen in the lower right. The bright white strip left of Diamond Head is the Waikiki Beach area. Further west are the downtown area and harbor. Runways of the airport can be seen in the lower left. The Koolau mountain range runs through the center of the image. The steep cliffs on the north side of the range are thought to be remnants of massive landslides that ripped apart the volcanic mountains that built the island thousands of years ago. On the north shore of the island are the Mokapu peninsula and Kaneohe Bay. 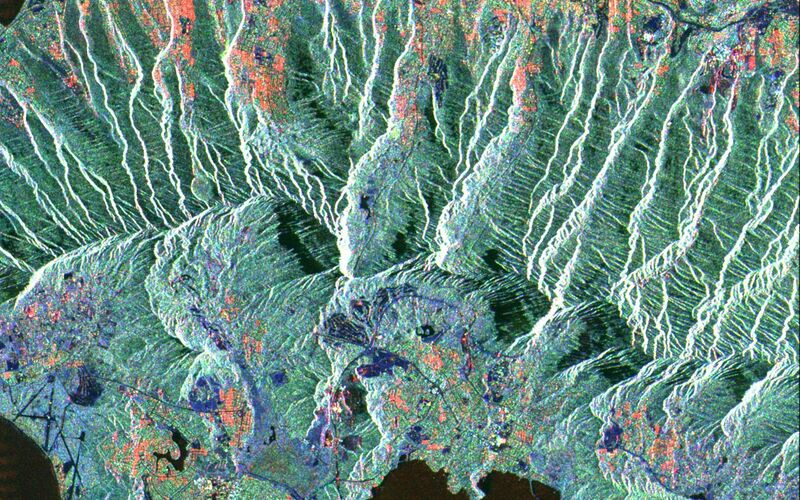 Densely vegetated areas appear green in this radar image, while urban areas generally appear orange, red or white. Images such as this can be used by land use planners to monitor urban development and its effect on the tropical environment. 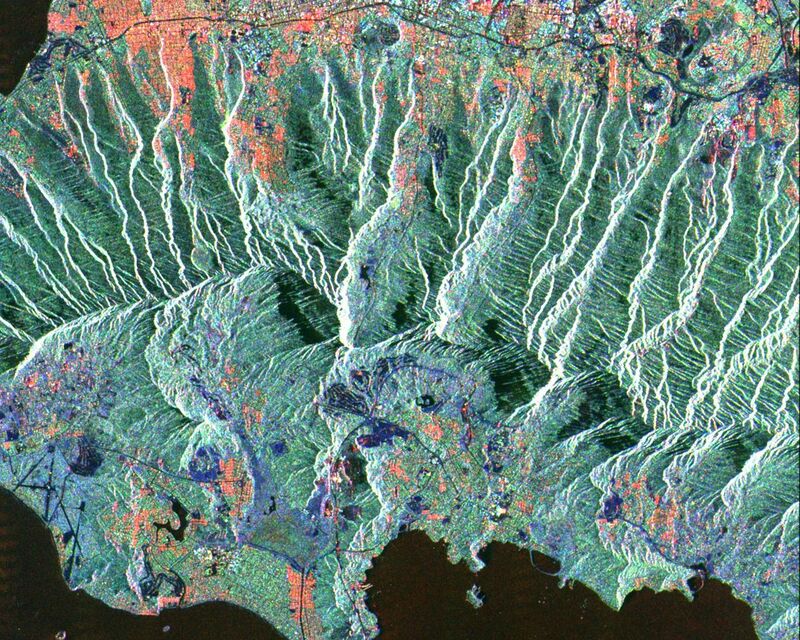 The image was acquired by the Spaceborne Imaging Radar-C/X-Band Synthetic Aperture Radar (SIR-C/X-SAR) onboard the space shuttle Endeavour on October 6, 1994.The image is 20.6 kilometers by 31.0 kilometers (12.8 miles by 19.2 miles) and is centered at 21.4 degrees North latitude, 157.8 degrees West longitude. North is toward the upper left. The colors are assigned to different radarfrequencies and polarizations of the radar as follows: red is L-band, horizontally transmitted and received; green is L-band, horizontally transmitted, vertically received; and blue is C-band, horizontally transmitted, vertically received. SIR-C/X-SAR, a joint mission of the German, Italian, and United States space agencies, is part of NASA's Mission to Planet Earth.